You want a chair that will get you through your day. 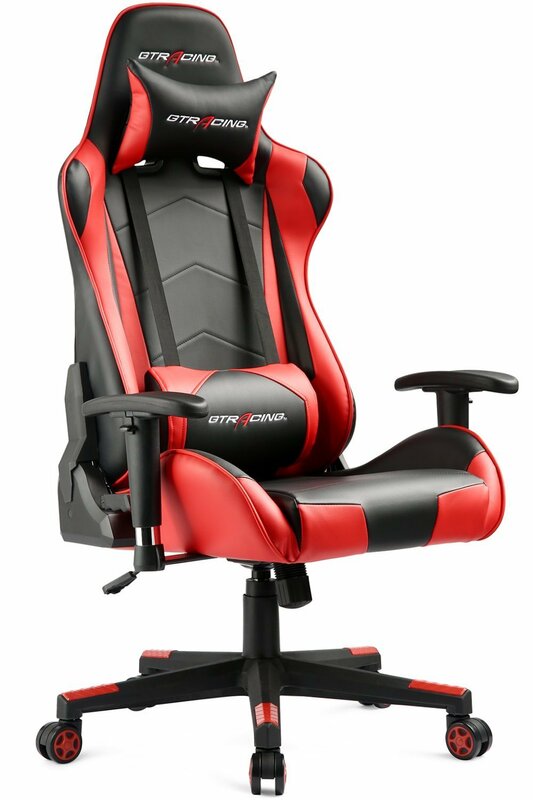 Whether you’re responding to emails, evaluating reports , or gaming with friends after work, the GTRACING high-back gaming chair provides not only sleek, professional style, but also sophisticated support for all-day comfort. To prevent repetitive stress, having the correct ergonomic posture is important when seated for a longer time. Seat adjustability makes sure every type of user from different heights can adjust the chair to their unstressed posture. Good range of height adjustability to ensure you are at the optimum angle in relation to your desk. Features independent back angle option. An angle-adjustable backrest to help you adjust your sitting position throughout the course of your working experience (even you can take a comfortable sleep when up to 170 degrees. Ergonomic design racing chair–more efficiently and comfortably, multi-function meet all kinds of body shape. Dimensions: 26.5″(L) x 22.5″(W) x 47.5″-52″(H); Maximum weight capacity – 330 pounds. 1-year limited warranty. Assembly instructions included.